Teens today have a difficult time handling disappointment. Maybe it is because they’ve always gotten a participation award for all the sports activities. Maybe it’s because as parents we have bent over backwards trying to make sure that our kids have everything they want or need. Maybe it’s because our kids don’t fully understand the impact of having to “do without” as kids had to deal with several generations ago. Or maybe it’s because that instead of having true relationships, we have technology. Regardless of the reason, the news is shouting at us to find a way to stop the tragedies we are reading about in today’s headlines. Before Christmas I interviewed on a podcast regarding the number of teen suicides that had occurred in the Atlanta area. The host asked what we as parents could do to help prevent these tragedies in our own homes. I know as a parent, that is sometimes easier said than done. I also know that this isn’t going to solve all the teen suicides we see today. Depending on our child’s bent and their emotional maturity, some can handle disappointment more than others. But regardless of whether our child is even aware of their propensity toward self-harm or potentially suicide or a number of other harmful choices such as drugs or alcohol, it is important for us as parents to learn to connect on a deeper level with our kids. We need to be asking the right questions even when our kids seem to be taking their disappointment in stride. Definitely the wrong way to deal with it on my part. It took me years to learn that it was her way of handling the disappointment. She would close herself off and try not to feel. What she really needed was time to process and then have someone walk through the emotional pain with her. I finally discovered that I needed to coax her to talk several days after the event and teach her to process and put words to her feelings. Most of the suicides I’m reading about all have the similar stories–kids that seem to have it all–what most would consider good homes, great academic potential, or top performing athletes. Some seem to be happy and well adjusted. They’ve had lots of success in their lives but have most likely had little disappointment. When the disappointment came it came like an avalanche. It was a monumental blow to their self-worth and they didn’t know how to process it. Regardless of the situation, part of our job as parents is to help our kids learn to accept disappointment as part of life. After all, as adults, we’ve come to learn that disappointment happens almost daily. As we mature we learn to figure out that regardless of the situation we can deal with it. Teaching our kids to process that emotional pain takes time and effort on our part and we can soften the blow to our kid’s self-respect. Our job is to normalize their feelings and teach them that tomorrow will be a better day, and they can get through the pain they are currently feeling. It will also bring a depth to your relationship as you walk side by side them. Teaching our kids to process their disappointment also gives us opportunity to share our faith and dependence on God. 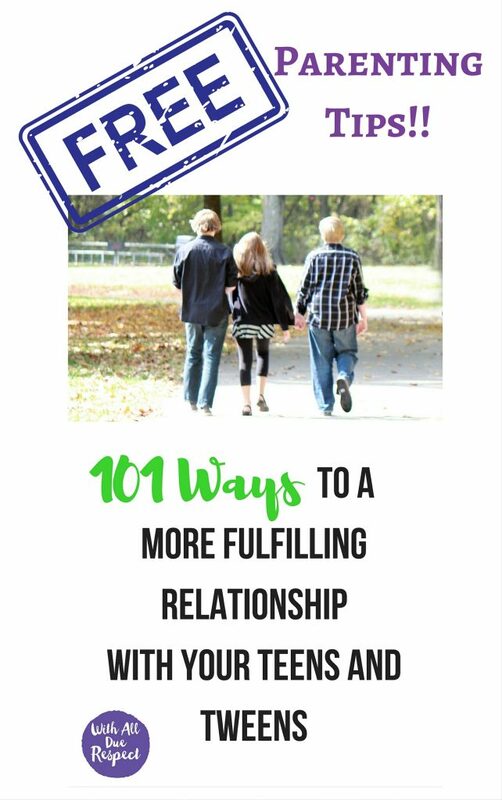 Here are some practical ways to help our teens and tweens deal with disappointment. Ask what happened in your kid’s day. Be sure to ask in a way that elicits more than a grunt or “fine”. Ask specific questions and be sure to read body language. If your teen says “no”, respect his decision for now, but be sure to re-engage and ask again. Sometimes kids can process in a short period of time and other kids will take days. Keep asking (but not too frequently), until they are ready to talk. Don’t be afraid to solicit help from a more seasoned mom or from a professional counselor. Part of our ministry is talking to moms on a daily basis about the struggles they are having with their tweens, teens, and 20-somethings. It is amazing what happens when we walk beside each other and can come to see our parenting difficulties from a different perspective. Dare you to join the moms just like you who are brave enough to deepen their relationship with their kids. Our With All Due Respect eCourse will give you the wisdom of many moms who have encountered similar parenting struggles without judgment. Learn what it takes to be intentionally engaged with your kids while deepening your relationship with God. 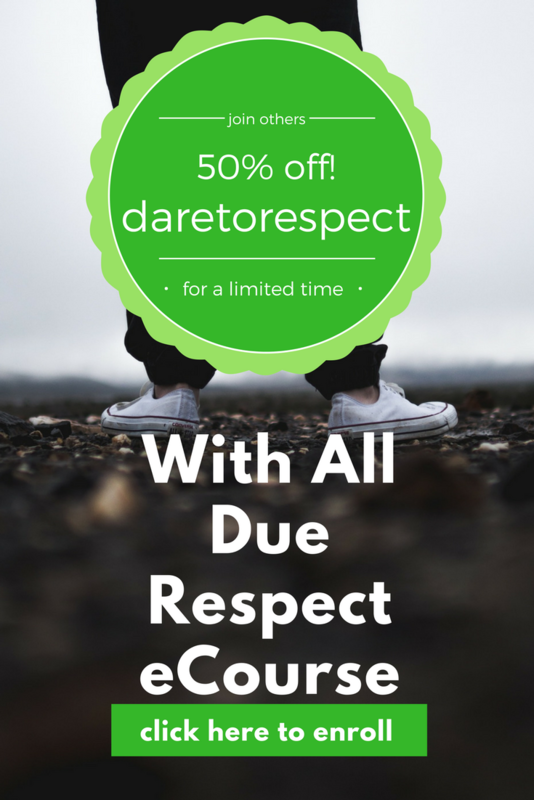 Click here to learn more about our With All Due Respect on-line eCourse.